Note to self - container conversion with GStreamer! It seems I have a number of video files that will only play in VLC and Core (TCPMP) on PalmOS. While that's not really been an issue for me up until now, I have recently been playing with a different device for watching movies on the can, and that prefers a more standard format. So here's a combination of GStreamer elements I used to get the video into an MP4 container that works a little better. Had our traditional Father's Day weekend camping at Butano State Park. Had a nice ride on Saturday. I did a ride I always enjoyed back in my days of riding. 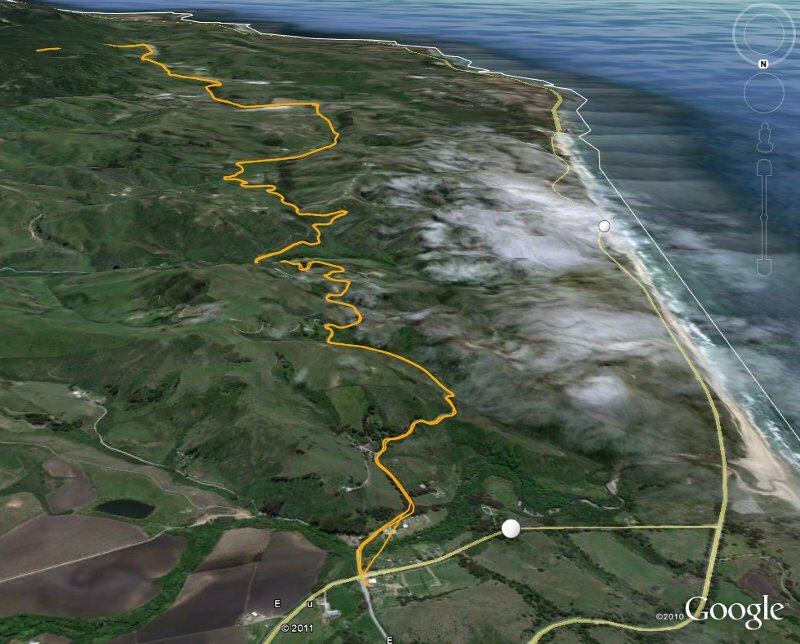 Ride from Pescadero over Stage Road to San Gregorio. Once in San Gregorio, it's nice to spend an hour at the General Store - having a drink, listening to some live music and enjoying the countryside, before returning over the hill to Pescadero. Not sure what the name of the band was on Saturday, but they a good varied set, with hints of Led Zep to country. The ride over Stage Road has a couple of hills in it. Moderate climb shall we say. Somewhere around 400ft climb in elevation. Nothing too hard if you're in shape, however at the moment I'm not. This year, given I was camping at Butano, it added a little extra to the ride, so my starting/ending point were at Butano. The last leg, from Pescadero back to Butano, were gruelling. It is all up hill (a shallow gradient) and given by that point I was already shagged, those extra 5 miles of steady climb were the last thing I wanted. I should probably have hung out in Pescadero for an hour to relax before attempting the final stretch. Given the Pescadero Country Store has been given a nice remodel in recent years, I could have easily spent some time there with a glass of wine. Sunday was spent at the beach. There was some sleeping on the beach, which was after eating lots of barbeque - well, we needed to finish off the beer, food and charcoal before we headed back home.